Laser facials provide the most benefit to those with mild to moderate sun damaged skin. The Cynosure Elite Alexandrite/YAG laser is utilized to eradicate facial redness and broken blood vessels, eliminate discolorations and brown spots, diminish acne bacteria, improve acne scars, stimulate new collagen and elastin production, as well as tighten pores and skin tone. Laser facials are non-ablative, with minimal damage to the skin’s surface, and without any downtime. Rachel Duke, NP will customize the laser treatment to safely rejuvenate the facial skin based on your needs. Multiple treatments are necessary to achieve optimal benefit. Four to six treatments are recommended at 3 to 4 week intervals. This treatment is not recommended for male patients. Treating the beard area of the neck and face may cause irregular hair loss and/or blistering. Individuals that may not participate in treatment may include the following: uncontrolled diabetics, history of keloids, suspicious skin lesions, taking anticoagulants, taking medication for which sunlight is a contraindication; unprotected tanning, sun exposure, or tanning creams/sprays one week prior to treatment with the YAG 1064nm wavelength; unprotected tanning, sun exposure, or tanning creams/sprays one month before the 755 nm wavelength for brown spots; seizure disorders triggered by light, photosensitivity, immunosuppression, lupus, and/or history of poor wound healing. Patients with a history of hyperpigmentation or individuals with darker skin types will need to be pre-treated with hydroquinone or similar topical bleaching agents 2-4 weeks prior to laser treatment and for 2 weeks following treatment. For patients with a history of cold sores (oral herpes simplex 1), a prophylactic antiviral medication like acyclovir should be considered prior to commencement of laser treatment. All lotions, creams, skincare products and makeup will need to be removed prior to treatment. Laser goggles must be worn throughout treatment. You may experience some mild discomfort from the laser exposure which has been described as the sensation of being “snapped with a rubber band”. After receiving a laser facial, your skin will need moisture, sun protection, and gentle at-home care. The skin may look slightly pink, flushed, or red in some areas, and feel warm. Any redness will fade over the course of a few hours and should not interfere with daily activities. Brown spots typically appear darker and continue to darken or look like coffee grounds over the next 24 hours. The brown spots and any crusting will slowly slough off in the next 7 to 14 days with daily cleansing. Immediately following the treatment, antioxidants will be applied to the face to expedite the healing process and stimulate more collagen production. A biocellulose mask infused with hyaluronic acid will be applied to the face for 10 minutes to cool, calm, and hydrate the skin. With laser treatments, patience will be needed before seeing results. Some results are immediate such as an enlarged capillary on the cheek that disappears immediately, while other spider veins diminish over time with subsequent treatments. Acne lesions may begin to shrink and dissolve within 24 hours of treatment while others may be more stubborn. With each treatment, the laser will slowly bring imperfections such as brown spots to the surface of the skin. 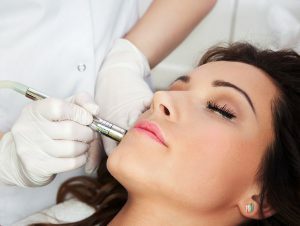 Pores and skin will appear tighter with each treatment. New collagen and elastin production will begin to occur within weeks after treatment and continue for several months after. With new collagen forming, the skin can appear healthier, lighter, and tighter. Cost is $325.00 per treatment.